But Jeep saying they want to make a Wagoneer and Grand Wagoneer to dent Range Rover sales for “up to” $140k is egregious?! Yo, the Hellcat Grand Cherokee is probably going to range from $84,995 to $104,000! Maserati isn’t going to build SUVs above the Levante, so let Jeep have it! Didn’t they just preview the detuned 575 hp Hellcat engine in that Ram Rebel TRX Concept? I think that’s kind of a good cue for what will be standard in the Grand Wagoneer. From what I’m hearing, the Wagoneer is a three-row Grand Cherokee Overland and Summit that will start at less than the Touareg’s $49,495 starting price (probably like $43,000 for a base Wagoneer). 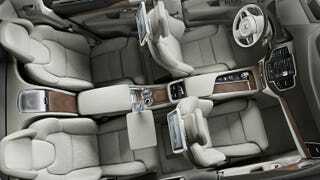 The Grand Wagoneer seems to be destined as a two row, 4-passenger luxury SUV with 1st class seating for rear occupants and could be 100% in line with the Range Rover’s pricing scheme but starting at just under $80k. I don’t see anything wrong with using Maserati interior materials and a retuned supercharged 6.2L HEMI V8 engine in a vehicle with Jeep’s off-road credibility to be a value oriented Range Rover competitor. I also wouldn’t be surprised if Jeep figures out a way to make a Grand Wrangler to go after G-Class buyers. Think about that? !